IKEA has teamed up with British designer Tom Dixon on a truly exciting project. Tom Dixon has designed for IKEA before, creating a unique collection of ‘hackable’ furniture. Now the duo is working together to encourage city-dwellers to grow food in their own homes. The project will include a range of gardening products and tools (no doubt beautifully designed) that allow those who live in cities to grow food, herbs and medicinal plants indoors. 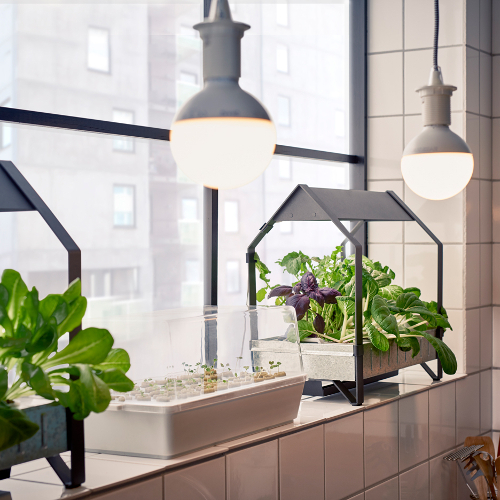 By launching this collection IKEA hope to empower people to live healthier and more sustainable lives, whilst building greater awareness of where their food comes from. “If more greens were to be grown in homes, it would have a positive impact on the planet with fewer transports, lower water usage and less food waste.” IKEA said. The company will be announcing the project at May 2019’s RHS Chelsea Flower Show in London with an installation showcasing their unique model for growing plants in cities. The collection itself is set to launch in 2021. If you can’t wait until 2021, fear not. This isn’t IKEA first foray into urban gardening. They launched the Krydda and Vaxer systems (available here) in 2016 which use hydroponics to grow plants and vegetables. The system requires no soil and no sunlight. Instead it uses a low-energy LED lamp to enable cultivation of certain plants year-round, making it ideal for those who live in apartments or small homes. March 18, 2019 in Interior design trends.